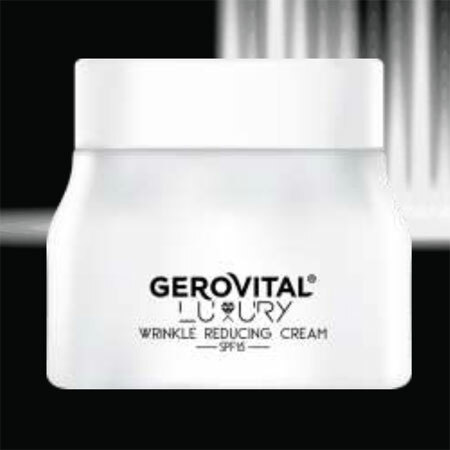 The Gerovital Luxury Wrinkle Reducing Cream SPF15 contains state-of the art active principles: Lakesis® with a protective action over the youth proteins, FOXO and Klotho which increase cellular longevity and Neodermyl® which improves the skin’s three-dimensional structure with a re-densification effect. By providing protection at cellular nucleus level and due to its “needless filler” type action with collagen and elastin, wrinkles are mitigated; the skin regains firmness and elasticity. Usage: Apply on cleansed face neck and decolletage. Massage gently with circular movements to help the cream's better absorption. INGREDIENTS: AQUA, ETHYLHEXYL METHOXYCINNAMATE, ZINC OXIDE (NANO), PENTYLENE GLYCOL, CETHYL ALCOHOL, GLYCERYL STEARATE, UNDECANE, TOCOPHERYL ACETATE, GLYCERYL BEHENATE, GLYCERIN, TITANIUM DIOXIDE (NANO), BUTYL METHOXYDIBENZOYLMETHANE, COPPER LYSINATE/PROLINATE, DIMETHICONE, DIMETHICONE CROSSPOLYMER, PHENOXYETHANOL, DECYLENE GLYCOL, CAPRYLYL GLYCOL, DISODIUM EDTA, NIACINAMIDE, TOCOPHEROL, HYDROGENATED PALM GLYCERIDES CITRATE, GLYCINE SOJA OIL, CAPRYLIC / CAPRIC TRIGLYCERIDES, PISTACIA LENTISCUS GUM, ADENOSINE, LACTIC ACID, GLUCOSYL CERAMIDE, SQUALANE, SODIUM HYALURONATE, PARFUM, PEG-75 STEARATE, CETETH 20, STEARETH-20, TRIETHOXYCAPRYLYLSILANE, TRIDECANE, HYDROXYETHYL ACRYLATE / SODIUM ACRYLOYLDIMETHYL TAURATE COPOLYMER, ISOHEXADECANE, POLYSORBATE 60, ALUMINA, BENZYL SALICYLATE, LIMONENE, LINALOOL, CITRONELLOL.